Here are more details about the lap robe designs. 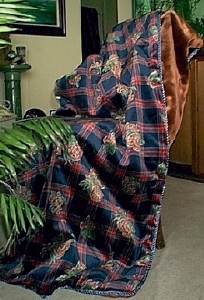 This is the Inverness lap robe, our best seller for twelve years. Wonderfully soft faux fur in medium brown is combined with a design in soft cotton velvet of subtle red plaid with roses on a field of green. A beautiful braided cord finishes the throw with elegance. 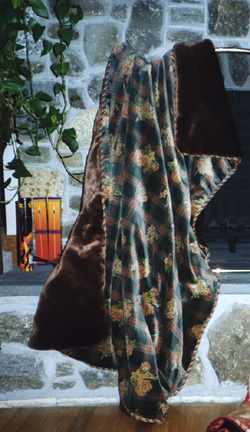 Lap of Luxury's Inverness lap robe measures 60" by 72". It is also available with the same red plaid and roses on a field of rich blue, trimmed in a blue and gold cord. Click on the link to return to the Catalog Pages or click a new selection at the top.